I treated myself last month to another fabulous course at Raystitch. This time it was the Stretch Masterclass taught again by the lovely Alice who helped me make my blocks last year. I had three fabulous evenings the result of which was one block to use for stretch dresses and one dress (and pattern) made with some lovely liberty jersey. The block was much simpler to make than the ones we made last year. Stretch fabrics are very forgiving so the shaping is a lot simpler. There were six of us in the class; we all chose to make very different garments and it was fun to see how to manipulate the pattern in different ways. 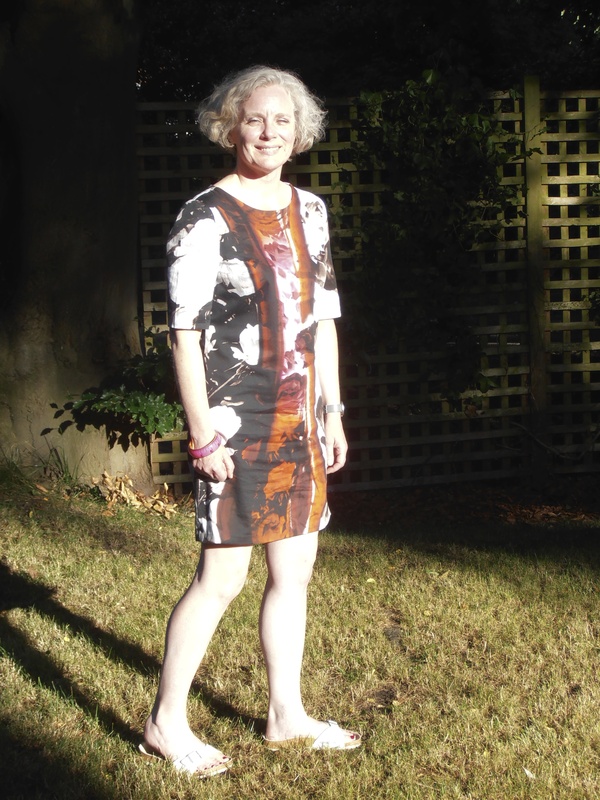 My dress is very simple with grown on sleeves, the others made a cowl neck top, a pleated neck top, a pretty v-necked dress with a full skirt, a skirt with godets and a summer dress. We checked the sizing on our blocks by tacking up the garments. This took me ages as I wanted to match all my checks. Once they fitted we overlocked the seams which took no time at all. This is the beauty of jersey fabrics, once you’ve got the pattern and the fit they are very quick to make; the overlocker finishes the seams as well as sews them and there are no fiddly fastenings to insert. 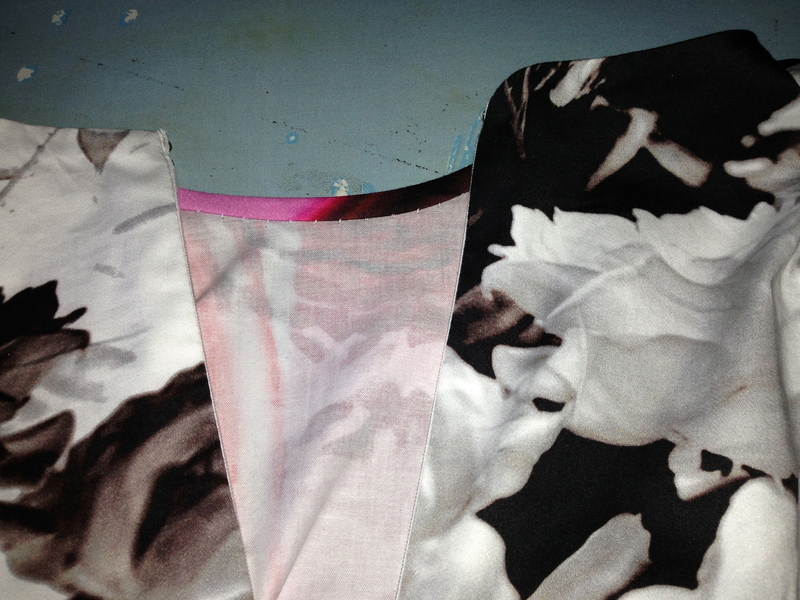 I finished the neckline on my dress with a facing, interlined with a stretch fusible. I hemmed the skirt and sleeves by hand using a herringbone stitch in order to give them a bit of give. This is a great dress. Perfect for scrunching up in my pannier ready for a quick transformation when I get to work. Alice recommended some very cheap M&S slips which give a smooth line. I’ll be making more of these! A couple of people asked for more information on this. The ones I bought are these http://www.marksandspencer.com/Pack-V-Neck-Assorted-Full-Slips/dp/B001F2EA6W?ie=UTF8&ref=sr_1_22&nodeId=309706031&sr=1-22&qid=1376720399. They are ridiculously cheap at £17.50 a pair. The pair I bought are marked as being natural on the web site but actually you get a natural one and a black one which was perfect for me. I found the sizing true to M&S’s guide. They come in three lengths so I got the shortest. With this sort of material they would be easy to cut shorter if you wanted to. Hope this helps. I was in two minds about the name of this post – should I call it Wine and Roses and should I call it Cruelle de Ville. As she’s always been a bit of a heroine of mine I decided on the latter. I found the fabric on a recent trip to Ditto’s in Brighton. They still have it on their website. I’ve been wanting to make a digital print dress for a long time but haven’t found one I like. Once I saw this I immediately knew was destined for a shift dress. The fabric is cotton, I think a sateen, with a bit of stretch, not so much that you have to use a stretch pattern, just enough to make moving around a little more comfortable. Marianna recently made a lovely lace shift using the Laurel pattern, so my original thought was to use the same pattern. Unfortunately I have a bit of a problem with Colette patterns which generally just don’t work on me. This one was no different. On my toile I got a good fit across the shoulders and bust but somehow it all looked a bit wide. The lower part of the dress was just weird and made me look like I had the most enormous hips. So I started again. This time I used my block which I have turned into a simple dress pattern with long darts front and back and small bust darts. All I had to do was to make the dress up with the bust darts in place but leave the other darts unsewn. The advantage of this is that the pattern on the fabric remains virtually in tact. I rather like the boxy shape it gives me in the middle but it has enough fitting around the shoulders, bust and hips to ensure it doesn’t look like a tent. The one bit of Laurel I went with was the neckline (yes buying the pattern was a bit of an expensive mistake when you consider I only used the neck line). 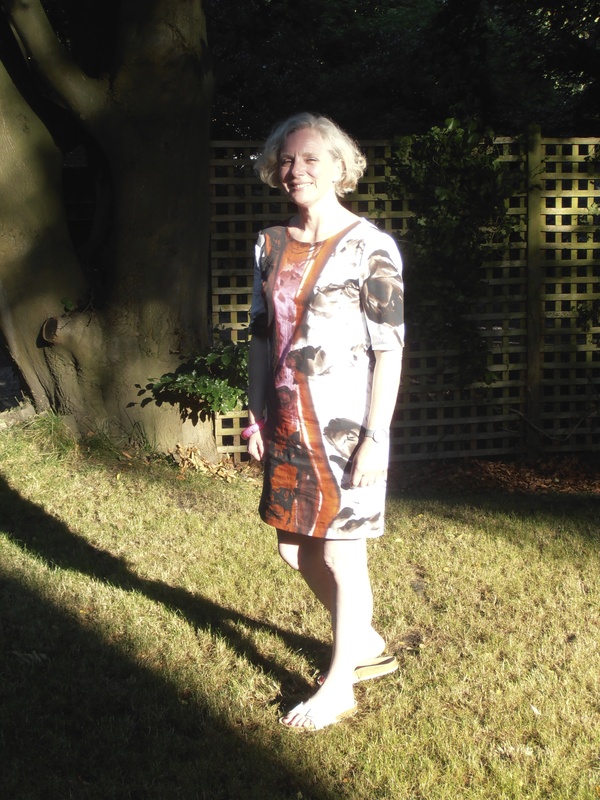 Once I had decided on the pattern making it up was relatively quick (three weeks of toiles and adjustments and general fiddling around and then one afternoon to make the dress). The PDF file that you can download to go with the Laurel pattern described how to use bias binding to face the neck line. Coincidentally I came across this tutorial from Ami about how to use my bias binding maker at roughly the same time. I’ve had one of these for a while but the instructions on the back were rather misleading (ok incorrect) about the width of fabric to use and I hadn’t managed to get any decent binding out of it. Ami’s tutorial is wonderfully clear and helped me work out where I was going wrong. Finishing a neckline in this way is my new favourite thing. It’s quick and simple. produces a lovely finish and you don’t have problems with facing flipping out when you put the dress on. We discussed the dress as a family and agreed that it looked like there was wine all down the front and the negative/positive print on the back gave it a Cruelle de Ville look. 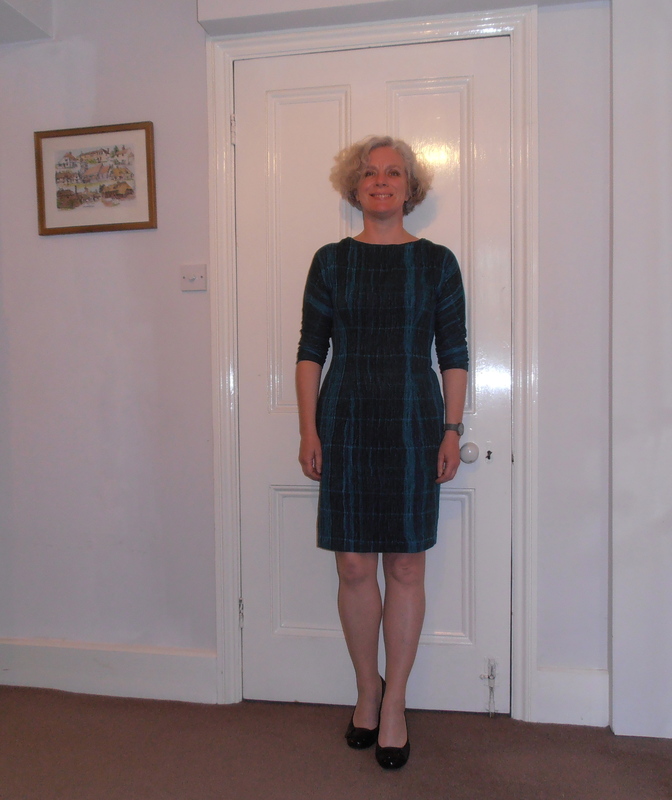 It’s a very comfortable dress and I feel quite smart in it. I have a friend who says the trick is to get the best fabric, I think she’s right; you don’t need complicated designs, the best dresses are just dependent on a good fit and a lovely piece of fabric.